I’ve knocked off a few more levels of Zen Puzzle Garden. I’m not sticking to the sequence at this point; I’ve visited every level in the game, and I’m skipping around freely, looking for anything that I feel like I have an idea of how to go about solving. I tend to pay more attention to ones with an unusual or eye-catching layout, of course. Especially since most of the levels pretty much look the same. Like I said before, this is not a game where you can tell the difference between an easy level and a hard one just by looking at it. There are a few levels that are split into multiple disjoint gardens, and there’s a mechanic introduced about halfway through, involving fallen leaves in three colors — the only vivid colors on the playfield — that have to be picked up in a specific order. That’s about it for variety, at least of the sort that you can notice without sitting and thinking about it. Fair or not, the effect is to make it seem like all the puzzles are more or less the same. Or, to put it more positively, like they’re all just instances of one big puzzle. Mathematical analysis really seems like the way to go here. I still haven’t really delved into that, beyond noticing a few patterns, local arrangements of tiles that correspond to solvability or nonsolvability. 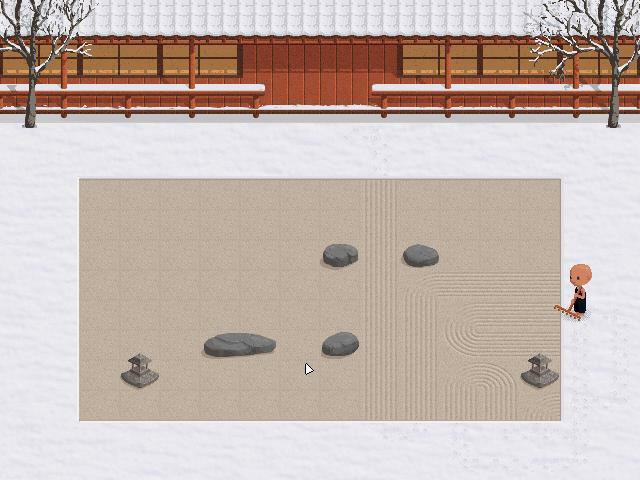 The most basic such pattern can be seen in the upper right corner of the board in this screenshot (although it’s too faint to be visible in the thumbnail): I’ve raked paths around a stone so that it lies in the inner corner. This makes it unsolvable. Consider the three tiles immediately to the north, northeast and east of the stone. Raking the north tile will necessarily involve going through the northeast tile, which will turn the east tile into a dead end. Likewise, raking the east tile will turn the north tile into a dead end. Either way, you’re stuck.